Merry Christmas! I hope that this post finds you enjoying a beautiful day with friends and family. Inspired by my most recent sewing project, I decided that THIS was the year to finally make myself a beautiful tree skirt. Now, anyone who knows me, knows that December is by far my busiest month of the entire year. This year felt particularly hectic, as I did my two school concerts, and my choir’s dress rehearsal, recital, AND full concert IN THE SAME WEEK. What was I thinking?! The logical response to such nuttiness was to start another project… Obviously. 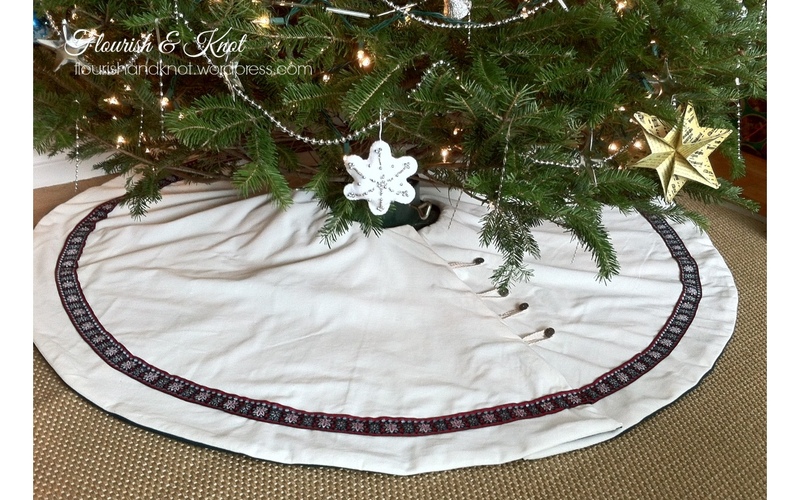 So, the weekend before THE WEEK, I started sewing my tree skirt. I was inspired by this one, but I quickly discovered that I could not get the kind of felt I wanted. I then tried to locate a nice, white fleece. No luck. Neon blue? Check. Pink with snowflakes? Check. But no plain white. Again, the logical response to Fabricville not having any of the reasonably priced fabrics you want is to pick the most expensive alternative. I wanted velvet. Well, the $18/meter price tag quickly put the kybosh on that plan, too. So I ended up with a white velveteen, on sale! I realized I’d need to line it because the velveteen wasn’t very thick, so, in a moment of total and utter genius (when I may or may not have actually cried out “lightbulb!” in a crowded Fabricville), I decided to make the skirt reversible! Genius, no? So I bought some beautiful emerald green gabardine (on sale) for the other side. And because I’m mean that way, I’ll make you wait until next Christmas to see it! Muahahaha! Sorry, I can’t even write that with a straight face. They were by no means perfectly round. But they’d do. For this step, I used the old pencil-tied-to-a-string technique. I folded the fabric in four and traced a semi-circle starting from one corner of the folded fabric. Then, I cut along the line. Complicated, I know. I used the cut-out circle as the template for the green side. Then I cut a straight line from one edge of the circle to the centre. The last step in cutting was to cut out the smaller circle at the centre. You know – the part with the tree trunk goes! Then, I pinned right sides together and sewed all the way around, leaving one of the straight edges open so that I could turn them right side out when it was finished. I then pinned in four loops of braid. Now you have to go a bit on blind faith for this step, because it seems like it just shouldn’t work. But it does! With the right sides together, you stick your loops in between the layers, with the ends of the loops where the seams will be. Then, you sew up the side, back-stitching at every loop. Leave a bit open so that you can turn it right side out. And voila! Magically, the loops are sewn into the seams. Then it was time to turn that baby right side out and press the heck out of it. It was at this point that I realized that I really should have cut notches into the seams every couple of inches or so. Rookie mistake. 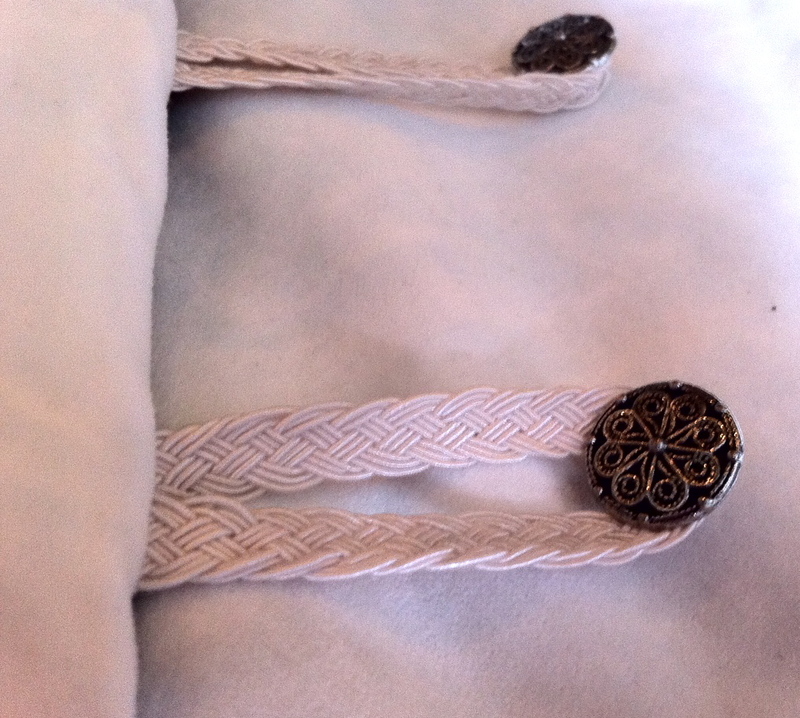 The next step was to sew on my braid. I had some gorgeous vintage Swiss braid that my mom bought when she was studying voice there when she was my age just a few years ago. 😉 I pinned it 6cm from the edge and then sewed it on. I wasn’t too worried about the stitch showing on the green side because I’ll be sewing co-ordinating braid on that side too – as soon as I find some that I like. By the way, the velveteen does not iron well. For the record, I ironed the heck out of that tree skirt before I took the photos… Whatever, it’s now covered in presents so who’s to see? I’m going to take this opportunity to wish you all a wonderful Christmas. I hope that you are enjoying the holidays with your loved ones, and my wish is that 2015 brings you peace and joy. I love this! Very nice! I love it! Circles aren’t the easiest to sew, and your came out beautifully. That is so pretty, and complements your tree so beautifully.